Demand aggregator platforms like Yelp, Tripadvisor, Groupon, Foursquare have grown at a breakneck pace. Even ten years ago, hardly anyone would have anticipated their multi-billion dollar valuations. They are strategically positioned on the demand side, unlike Uber and Airbnb who are positioned on the supply side. Yelp is one of the largest user-generated review platforms. Unlike Uber and Airbnb, Yelp had their IPO in 2012 and is now a public company. This gives us access to their annual reports which have lots of hard data on the platform business model. Join me for an exciting discovery of Yelp’s business model and that of directory / review businesses in general. “Yelp connects people with great local businesses by bringing “word of mouth” online and providing a platform for businesses and consumers to engage and transact.” Yelp annual report. Yelp helps users to find local businesses like restaurants, shops, bars, home services and more. It is not a coincidence that “Yelp” resembles a shorter version of “YellowPages.” But they are more than a directory. They display the ratings, reviews, pictures that users post to give others valuable information in their choices. “I’ve taken out ten ads in OC Weekly this year and have gotten maybe one call,” says Hall. “I get anywhere from five to 15 calls a day from Yelpers. They come in and then write reviews. Then other people see the reviews, think it must be great, and call. It’s its own little biosphere. It feeds itself.” This snippet from an early fortune magazine article explains what makes Yelp appealing to local business owners. and it is the opportunity to make (additional) earnings for one side of the platform. Local businesses can advertise among the user-generated content. The advertising model is Yelp’s main revenue source (90%). Yelp is slowly entering into the transaction business such as ordering food, making reservations and other transactions through their pages. The advertising model compares to Tripadvisor who make most of their revenues through advertising. The transaction model compares to Booking.com who make their revenue through a commission that is a percentage of the booking fee facilitated through their platform (note that Tripadvisor has also entered the transactions business more recently). This is the Business Model Canvas as devised by Alex Osterwalder. We are going to use it to understand how Yelp works. I will start with the value proposition that connects the supply and the demand side as this gives me an opportunity to fuhrer explain what Yelp really does. Platforms are multi-sided businesses. Yelp has three sides being local businesses, users and content creators. And they have to have a value proposition to all of these sides to be successful. On a higher level, it looks like this. * Reviewers are a subset of the users. But they are crucial. They create the value that non-reviewing users consume. Normal users may write provide star ratings and the occasional brief review. Their ongoing high-quality reviews are one of the key assets of the platform, an inspiration for other reviewers and users. High-quality reviews are also the cornerstone for free organic traffic from search engines. Many of the above fall into what economists call reduction of search costs and transaction costs. Regular review contributors are key partners. There is no benefit for them as such. And yet they spend their time and creativity. The Yelp percentages will differ. But that doesn’t change the fact that those who leave written, high-quality reviews, pictures or videos are crucial. They create the knowledge base that Yelp is based upon. The creators also inspire others to at least leave a short comment or rating. Yelp does a lot to keep these folks engaged – more in a minute. In 2015, Yelp bought a food-ordering service, Eat24, for $134m. Later they sold it to Grubhub (for $287m) and started partnering with them. 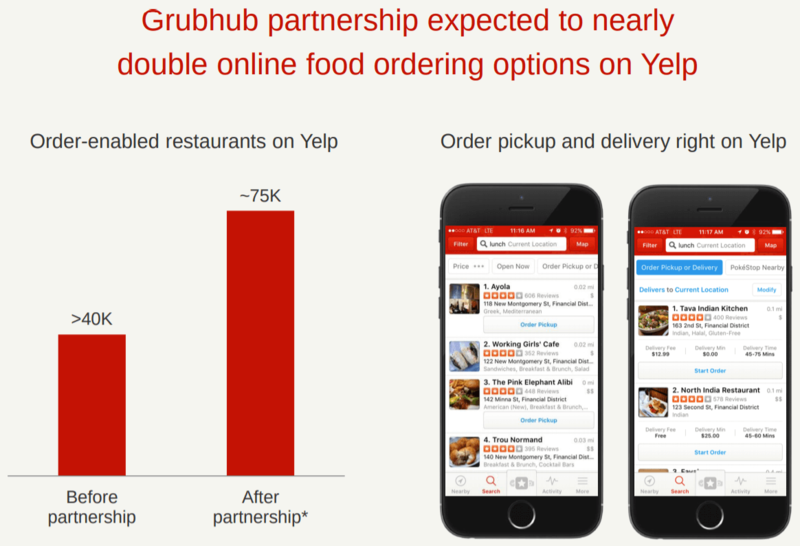 Yelp receives a commission for every order they provide to GrubHub. Yelp partners with Nowait, a local service platform that helps you eliminate waiting times at restaurants. Yelp partners with SweetIQ to provide local businesses in-depth local analytics. Developers: I would add the group of developers to extended partners, Here you can see some showcases. It is still early days for these partnerships. Some of these may turn into key partnerships depending on the revenues and complementary network effects. It is very typical for platforms to experiment through partnerships and acquisitions. These are partners without being key partners. Search engines are a source of significant amount organic (=free) online traffic but also an increasing source of major competition. 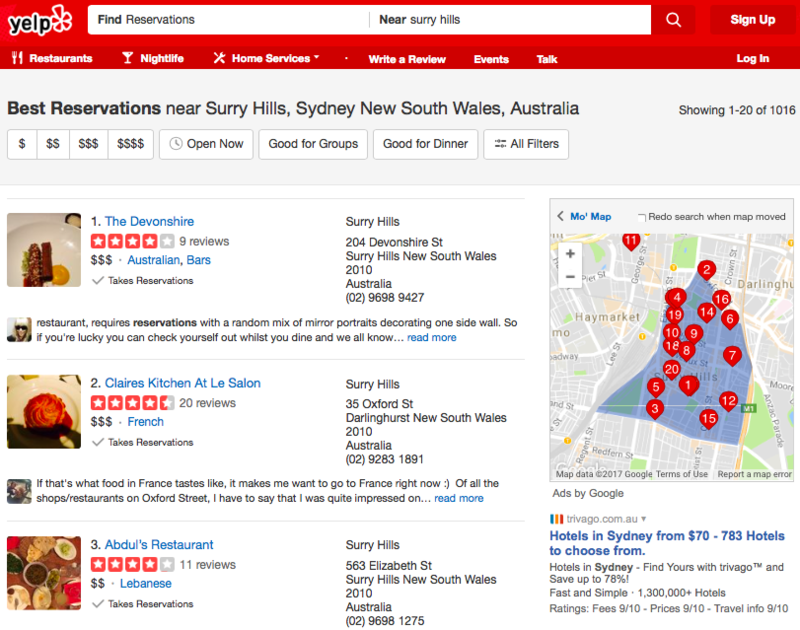 Yelp has partnered with search engines Bing, Yahoo to have their reviews and ratings listed within the respective search results and maps. But this was in the early days. Since then the search engines have also been sourcing their content from other platforms, such as Tripadvisor, Zoomato, Facebook, etc. The relationship with Google is even more troubled. Google has their own local search results and rating system. It has ended up at the Federal Trade Commission (FTC) for potentially favouring their own search results, Yelp has supported these allegations. Check out what Google does for their reviewers in comparison to Yelp’s Elite program here.Here’s a quick test: check for your favourite cafe in different search engines. Yelp is now only one of several content providers for them. The risk of significant reduction of organic traffic would hit Yelp hard. Government agencies: In 2015, the General Services Administration (GSA) have invited Yelp to support monitoring official government pages, e.g. the Transportation Security Administration (TSA) and other administrations. I have talked at length about the troubles Airbnb, Uber and other platforms are facing with parts of the public and local governments. Yelp is not spared of similar trouble. Partnerships like the GSA one can help Yelp to gain credibility and legitimacy. Lobbyists: In 2013, Yelp hired their first lobbyist to influence legislation potentially affecting them. In 2016, President Obama signed the The Consumer Review Fairness Act that bans businesses providing services only in return for signing a contract that “prohibits or restricts an individual […] from engaging in written, oral, or pictorial reviews, or other similar performance assessments […], including by electronic means” – a practice that had started as a reaction to online reviews. Why did the small business owners not make it on the list of key partners? This is quite a difference to Airbnb and Uber where we include the home owners and drivers as key partners. The reason is that Yelp has positioned themselves differently on the supply-demand map compared to Uber or Airbnb. Uber drivers and Airbnb home owners are the providers of their inventory. This role is taken by the content creators on Yelp, not by the business owners. Their businesses can be added and rated without the business owner’s actions. As with the other platforms, I don’t include cloud, maps, payments and other providers as key partners. These services have become standard and not a source of competitive advantage or the basis of leading functionality. I have only added providers of leading-edge, proprietary (and ideally exclusively provided) functionality into the category of key partners above. What are the chances you come back and check for similar articles? If you are liking this article, don’t forget to sign up for future articles at the end this one. If you find this as exciting as I do, jump to page 8 of the annual report to read more including numbers and stats of the contribution of the communities. The master resource (or asset) of any platform are its network effects. It is the resource that needs to be built and the nurtured. In Yelp’s case, this is having a large and growing inventory of local businesses for users to discover with good descriptions, reviews and ratings associated with this. Yelp has three sides to their business: content contributors, local businesses (supply side) and users (demand side). I have covered the contributors extensively above. So, let’s have a quick look at the local businesses and the users. Keep in mind that there are many ways to segment and micro-segment depending on the questions you want to have answered. Segmentation by features (close to 40 features at this stage), e.g. This is one of the most important categories for Yelp’s business model and one of its biggest risk areas. Every platform causes disruption to the status quo. And that upsets those that are (or fear to be) worse off. Yelp is not any different. Several lawsuits (over 2,000 with the Fair Trade Commission) have been filed against Yelp basically accusing them of extorting businesses into buying advertising. So far, not one lawsuit has even led to a trial. A detailed study by Harvard professor Michael Luca has found no empirical correlation between being advertiser on Yelp and more favourable reviews. A lively article from Sandra Allen on Buzzfeed comes to similar conclusions. We can be certain that Yelp filters work independent of the fact whether or not a business advertises on Yelp. Yelp is making clear that they treat everybody the same, irrespective if they buy ads or not. Their respective FAQ page links to a number of articles and the independent academic studies (M. Luca) on the topic. As you can see, a staggering 29% are not recommended or removed. As the algorithms evolve, reviews can be re-categorised. Sting operations to uncover providers of fake reviews and investigate suspicious cases. Consumer alerts that put a time-limited (90 days) cautionary note on those business’ pages that have been determined to have engaged in misleading customers. Most platforms are still young companies or start-ups. Their biggest cost-driver are the costs of customer acquisition (CAC). For Yelp it’s quite similar. Yelp has a very large sales force, whereas many other companies spend more on marketing (online and offline) as such. The other big cost for start-ups is the Weighted average cost of capital. Yelp is already publicly listed. Yelp’s WACC (based on the methodology described in the source) is a reasonable 9.09% (it has come down from >20% in 2014). Unlike the platform businesses we have looked at previously, Yelp is already post-IPO and thus obliged to lodge a form 10-K with the SEC annually (here is the 365-page pdf version and here is a simplified investor presentation). I recommend having a look at the full form 10-K (only the first 60 are interesting) if you are interested in learning in-depth about Yelp. incentive compensation & stock-based compensation for sales staff. stock-based compensation expense for engineers, product management and IT staff. stock-based compensation expense for executive and other administrative employees. confirmation and delivery services associated with Yelp Eat24. amortisation of purchased intangible assets. And the last full year result (2016) being $716m. 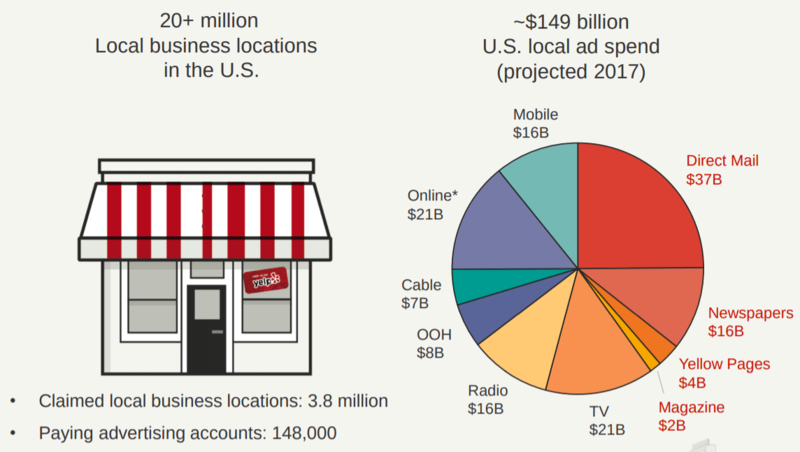 Yelp shows that the local advertising market is worth approx $150b in the US. And that there are opportunities to grab a larger share of this market. Yelp believes more of the ¬$70b offline advertising dollars will move into digital ads which can target the right customers better and achieve better ROIs on those dollars [source: Yelp investor presentation]. Yelp’s last annual revenues of $716m are a mere 0.5% of the total cake. Only 3.6% of the businesses (148k/3.8m) that have claimed their profile on Yelp are yet paying advertisers. And only 19% of existing businesses (3.8m/20m) have claimed their Yelp business profile. These are opportunities to grow. Yelp will aim to focus on enhancing their network effects by increasing engagement and value (content, algorithms, transactions) of the platform. They have reduced significantly their marketing activities on many international markets so they can better focus on the US. This can be a good strategy to get to critical mass as I have explained before. One competitor on the transactions business – OpenTable – has gone through the same learning when they have withdrawn from many cities in the US to focus on their 4 largest cities to then expand once they had reached critical mass there. Yelp is likely to try to improve their value proposition in the US to increase their market share. For any platform business model to work there must be an economic value add to all key participants. The platform can only extract value to the extent it creates in sum for the participants (add to that the extent they grow the overall market). The value that the normal user derives is a better discovery experience with more valuable results to their search and lower search costs (i.e. time and reduction of risk choosing the wrong business and running into buyers remorse). These are largely intangible but yet very powerful rewards for the normal user. Professor Michael Luca has found in a 2012 study that each “star” of a Yelp rating affected the business owner’s sales by 5–9 percent. Professors Michael L. Anderson and Jeremy Magruder from UCLA Berkeley have found that an increase from 3.5 to 4 stars on Yelp resulted in a 19 percent increase in the chances of the restaurant being booked during peak hours. In their investor presentation (pg 23), Yelp calculates that advertisers get a 269% Return on Investment on their ad dollars. 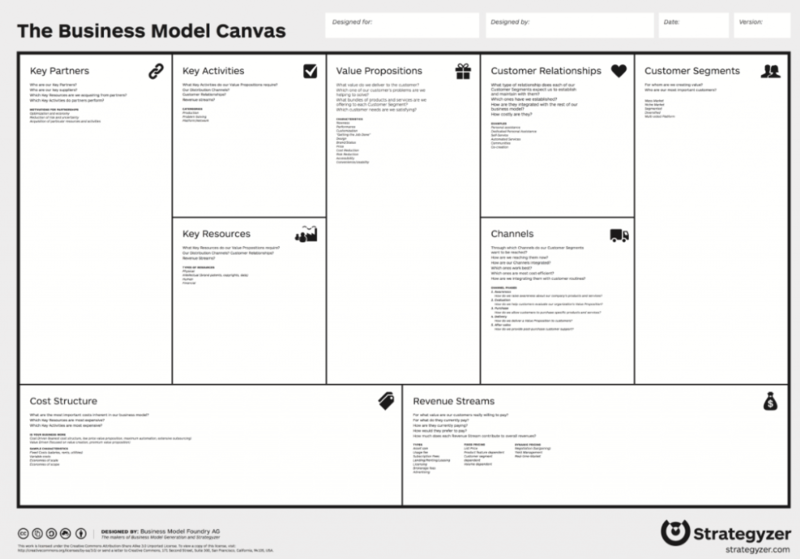 So, now finally we can put all of the above into the platform business model canvas. 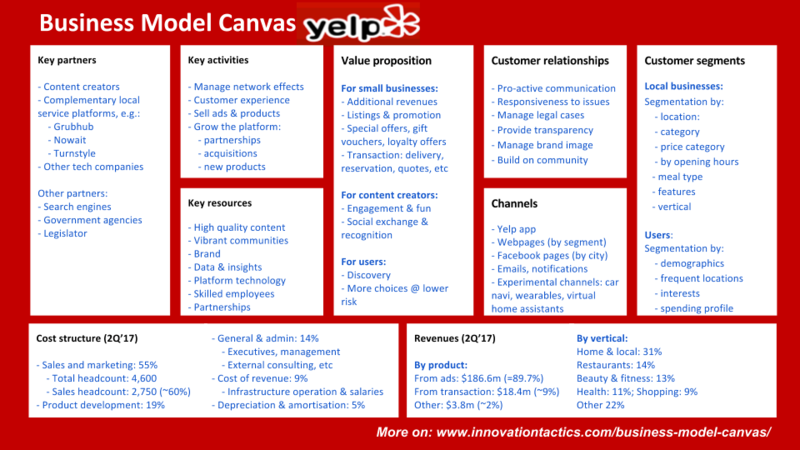 Here is the Business Model Canvas Yelp summarising the above. You can download it here as pdf. They are all public companies and thus you can start with their annual report (their revenue tactics are different to Yelp). Plus there are also tons of articles about them for your research. This exercise would take you a good 4 hours using this article as a starting point.